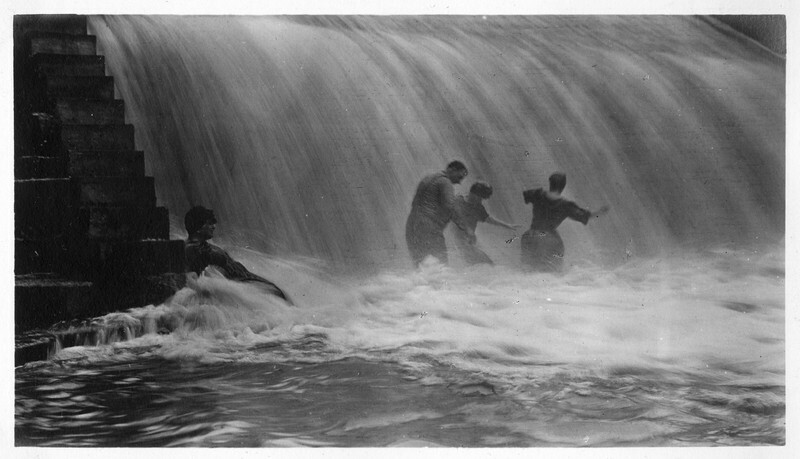 Bathers, friends of Martha Blow Wadsworth (wife of Herbert Wadsworth), frolicking in the falls at the Triphammer site in the southern part of the town of Avon, N.Y. The Wadsworth family of Geneseo owned a flour mill at this spot on Conesus Creek, near where a trip-hammer and forge were also located. Wadsworth, Martha Blow (1864-1934), “Triphammer Falls, town of Avon, N.Y. ,” OpenValley, accessed April 22, 2019, https://openvalley.org/items/show/74.